The early medieval army was composed of about one-third mounted knights, a few professional soldiers, and the rest were peasants who were conscripted for the battle. The soldiers wore whatever they had available; most were clothed in a leather jerkin with iron rings. They carried a battle shield for better protection. The typical knight wore steel-mail hose on his legs. On his upper body the first layer of clothing to protect from the steel hauberk was made from felted hair or quilted cotton. That particular garment is now referred to as a gambeson. 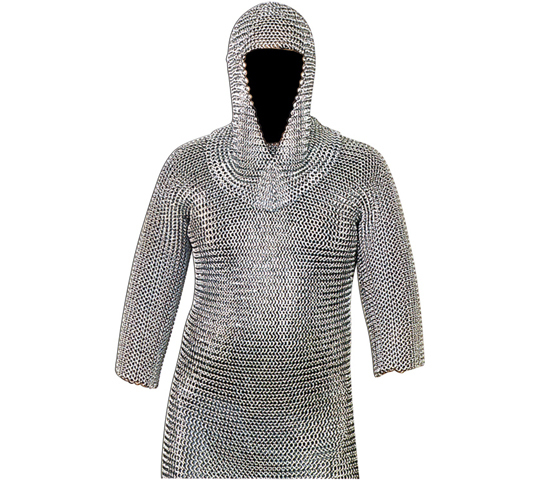 The next upper body mail article was the riveted steel hauberk, and it often extended to mid-thigh or below his knees. This armor could weigh between 19 to 60 pounds, dependent upon the amount of money the knight could give the craftsman. The lighter pieces naturally were more expensive. The hauberk was subject to rust, so a game was devised to rid the corrosion from the article. Sand and vinegar were placed in a bag with the chainmail and it was tossed back and forth between the soldiers. This protection was insufficient to protect from the sword, lance, flail, mace and axe. Later in the century a chainmail coif was developed to protect the head.